Glucose is the main source of energy for human activities. Diabetes is a group of disorders characterized by chronic elevation of blood glucose. Thus, determination of blood glucose is a basic method for the diagnosis, treatment, and follow-up of diabetes. In addition to blood, many types of body fluids contain glucose. Continuous glucose monitoring (CGM) technology was first applied in clinical practice at the end of the twentieth century. It monitors the glucose concentrations in subcutaneous interstitial fluid through a glucose sensor and is able to provide continuous, comprehensive, and reliable all-day glucose profiles, thereby allowing for an understanding of the trends in blood glucose fluctuations, and to detect occult hyperglycemia and hypoglycemia that cannot be detected by traditional glucose monitoring methods. The detection equipment for measuring interstitial fluid glucose concentrations is mainly divided into two categories. One is minimally invasive technology in which interstitial glucose concentrations are continuously monitored with a subcutaneous glucose sensor, also known as the CGM system, which can be categorized as a retrospective CGM system or a real-time CGM system. The other is noninvasive technology, in which glucose is extracted across the skin for monitoring of glycemia using weak current electrodes close against the skin. 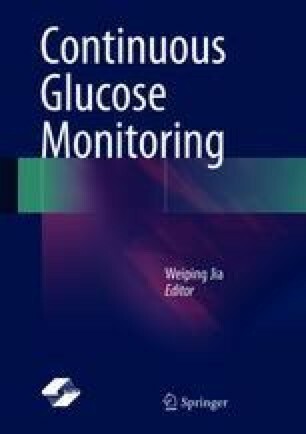 This chapter will introduce the metabolism and regulation of glucose in the body, the detection of the interstitial glucose concentration and its clinical significance, as well as the principle of CGM technology.